I try not to work while I’m on holiday, which includes trying no to thinking about work related things but sometimes it’s hard to ignore people who are doing things brilliantly. 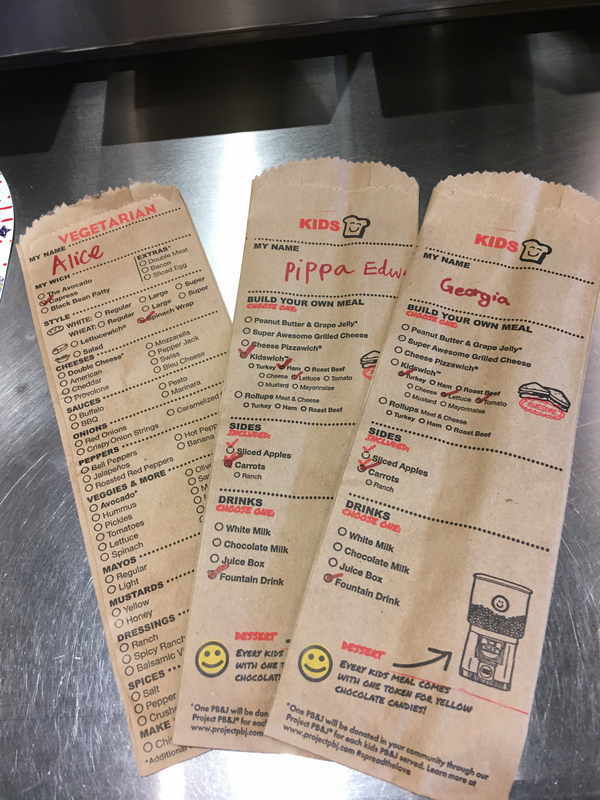 This happened over the summer on our big family trip to the US where we were ate out a lot and one restaurant really stood out for its innovative approach to ordering. I’ve been wanting to share great ‘Systems’ which are the foundations of how a business delivers its goods or services where technology is not the driver. There are so many great systems to get things done out there that don’t use tech and I think we should celebrate them more, and I hope you’ll agree this is a great example. The system I want to share is from the sandwich bar called Whichwich. When you enter the restaurant you see a huge board with all the options for food and below is a box holding adult and child menus, which are printed onto paper bags. You grab a sharpie and tick the boxes for the food and drinks you would like, including all the extras you could think of and go to the till to pay, giving in your bag. The bag then gets clipped to a washing line style wire and scooted down to the sandwich makers. They have your order right in front of them so they are able to make it easily and with no handwriting to misinterpret there is a high chance you get exactly what you requested. When the sandwich is finished it is put into the bag (which you wrote your name on) and the server calls out your name for you to get your sandwich. Isn’t that brilliant! Wichwich have solved a number of potential problems that you can come across in a sandwich shop while making their customers even happier with a unique ordering experience. This ordering system has no technology involved at all, they’ve taken it right back to basics, but the outcome is a huge improvement on the usual sandwich ordering experience where you don’t always realise the options and have to repeat your order several times to a staff member only to get the wrong thing at the end. Have you spotted a great system recently? I’d love to hear about it!